The earliest evidence of settlers in the area is the discovery of an Iron Age funeral pot, complete with ashes, dated c1500BC at Upton. 700 - 900AD Anglo Saxons settled in this part of the Nene Valley. 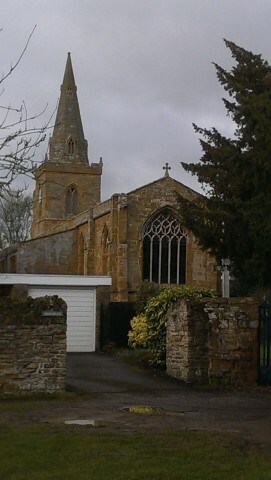 1042 - 1066 The parish of Ceselingeberie (as it was known then) was owned by a Saxon thegn name of Tonna, who also owned parts of Heyford, Stowe and Easton near Stamford. 1086 Domesday entries show Kislingbury divided into two manors, the smaller awarded to the Earl of Moreton by William the Conqueror. The larger given to Gilbert de Grant. Population ca.180 to 200. Through the years the village was owned by various families until eventually it was owned by Warine de Lisle who took up arms against the King Edward II in 1326 and was subsequently executed. Built in the 14th century from Northamptonshire ironstone the church was restored c.1700 with some alterations, the tower restored in 1717, the spire rebuilt in 1926 and the body of church restored and vestry added 1829-30.